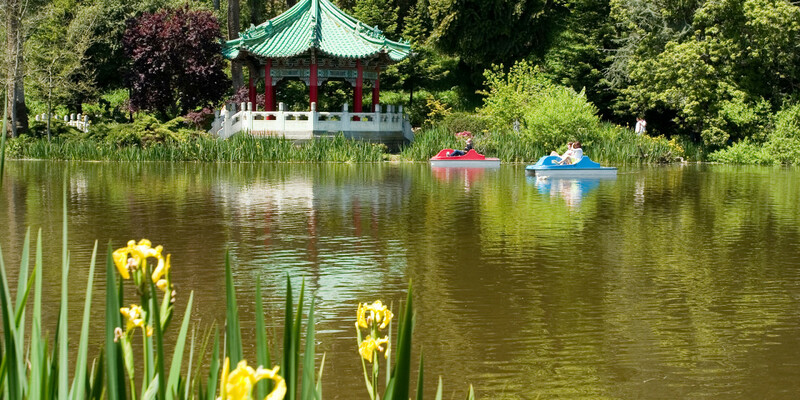 Golden Gate Park is home to ten lakes within the more than 1,000 acres of land designated to one of the most popular places to visit in San Francisco. Throughout the year, there are plenty of sights to see and an array of activities taking place at the lakes, including model boat regattas, waterfalls, pedal boat rentals, and intriguing displays of wildlife. A prepared visitor is one that comes with a camera in hand – ready to take a snapshot of one of life’s many precious moments. From mesmerizing ripples in the water to native bird air antics, you never know what you’ll encounter at the lakes of Golden Gate Park. Viewed as one of the most pleasant lakes in the park, Mallard Lake offers a place for an entertaining family-friendly outing to unfold. The local ducks welcome guests who come bearing gifts…stale slices and crumbs of bread. A nearby picnic table provides a nice spot to have lunch. Many come to test out their binoculars at this lake, which is located along Martin Luther King Jr. Drive. Touted by some for having the most convenient parking during a lake visit, you can easily reach the front of Metson Lake by entering through Lincoln Way on 25th or 41st Avenues. Known for its pretty scenery, shady stream, and low traffic, the lake also offers an enjoyable visit from an abundance of local wildlife. As one of the most scenic lakes in Golden Gate Park, Spreckels Lake is home to Monterey Cypress trees, a variety of wildlife, as well as the San Francisco Model Yacht Club, which holds frequent events, competitions, and activities. The lake is highly frequented by bikers, joggers, walkers, and exercisers. The lake is located on Spreckels Drive at 36th Avenue. With convenient parking and close proximity to interesting attractions in Golden Gate Park, Stow Lake is home to a historic boathouse and café within the park. Visitors may rent rowboats, pedal boats or motor boats on an hourly basis. You will find Stow Lake situated between John F. Kennedy Drive and Martin Luther King Jr. Drive (west of the Japanese Tea Gardens). Offering the elegant Portals of the Past, which serves as the backdrop to many wedding ceremonies over the years, Lloyd Lake delivers a tranquil setting for visitors. It is located on John F. Kennedy Drive and 23rd Avenue. One of the most pleasant lakes in the park, Elk Glen Lake is found at the foot of the 25th Avenue entrance and Martin Luther King Drive. A pleasure for bird watchers, the lake is less frequented by crowds, even on weekends. Keep an eye out for the blossoming of the cherry and plum trees on the east side. Found on 501 Stanyan Street, Alvord Lake is a small manmade body of water located close to Sharon Meadow, Kazar Drive, and the historic Alvord Bridge. Natural features of the lake include ferns, reeds, and the nearby pedestrian tunnel with cavern-like detail.